We've seen close-ups of the Moto 360 smartwatch already, but these latest leaks show off an as yet unseen charging dock. The matte black pod cradles Motorola's flagship smartwatch, apparently charging the teched out timepiece wirelessly through Qi standard inductive charging. That's the same standard rumoured for OnePlus' mystery OneWatch. The watch's face appears to show a battery percentage while charging, offering up a tron-style blue glow ring to indicate juice-levels. We haven't seen anything similar to this so far from any other smartwatch companies, so it's an interesting precedent to set. The rest of the pictures show off the usual smartwatch fare like customisable watchfaces, weather apps, music playback controls, a pedometer, alerts and notifications. 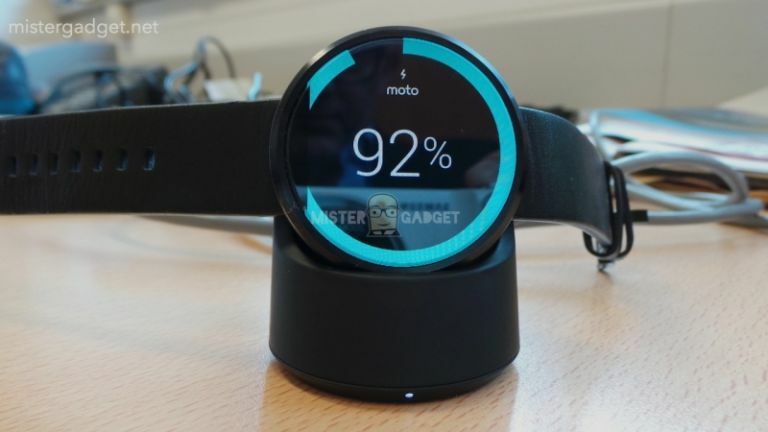 The leaked images come courtesy of Mr Gadget in a report by AndroidWorld and reveal the Moto 360 from all angles. Motorola showed off its Android Wear-toting Moto 360 in a close-up video earlier this year, revealing plenty of features and an in-depth view of the watch's design. Unfortunately we still don't have a set release date or price point for Motorola's smartwatch, despite it appearing finished for several months now. Is this the smartwatch everyone was waiting for?